After last night’s posting about how reverse osmosis water filters we expected — and subsequently received — a number of questions regarding the efficiency of reverse osmosis water filters when it came to the ratio of filtered water retained versus water discarded. First of all, yes, reverse osmosis water filters do discard water down the drain as part of their operating process BUT the numbers quoted by our friend at, well, that store, sound like numbers taken from either the worst reverse osmosis systems currently in production or from the owner manuals of units from years ago. These days reverse osmosis units remove an extreme amount of potentially dangerous, unwanted drinking water contaminants and during that process they do create a waste water stream, yes, as we said a minute ago, but where did you THINK all those contaminants went? The discard water washes away all the contaminants that get filtered out of the source water. Without the flow of discarded water, the contaminants would remain trapped someplace in the reverse osmosis membranes and quickly cause problems with clogging. If you think buying bottled water will somehow ‘save the planet’ from unnecessarily wasted water, think again. The next time you fork over your well-deserved money for a conveniently packaged, well (or super) purified water, take a good look at the label and more than likely you will see that it came from a water source that got filtered, more than likely at some point, using reverse osmosis. That means on a grand scale, at some water purification factory, hundreds of thousands (and possibly millions?) of gallons of water a year get ‘wasted’ so that you can sip clean water from your recently purchased, overpriced bottle of water. When finished with your purchase of a product that more than likely ‘wasted’ water, please do not forget to properly recycle that plastic bottle, OK? Throwing it in the trash along with other waste and saying, “My city doesn’t recycle.” … doesn’t cut it, either. Tons of communities do not have official recycling programs but if you asked around we feel quite certain you could find the names and locations of a few places where you could properly deposit separated, recyclable products. Not Sure if You Need a Water Filter? WaterCheck Test Kits Can Help! The convenience of bottled water comes with the burden of social responsibility. More people need to realize that… and the fact that most bottled water companies utilize reverse osmosis as a means of purifying their product. As a general rule, older reverse osmosis units did discard more water than the newer reverse osmosis units and pretty much no one will dispute that fact…. but the ratio of discarded water to clean, dispensable drinking water has come down quite a bit and many reputable reverse osmosis units now claim to discard as few as 2 or 3 gallons of water for every gallon of filtered drinking water produced. So, if safe, clean drinking water does not appeal to you because of a belief that reverse osmosis water filters ‘waste’ water, then perhaps you should give up a few other things… like clean dishes, clothes, bodies, and toilets. 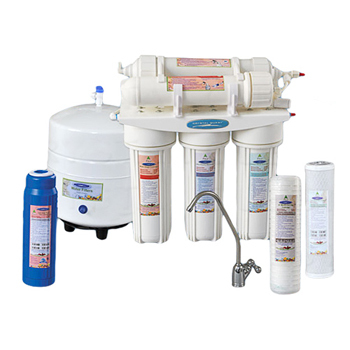 Check the the ratio of discard water versus retained, filtered water of any reverse osmosis water filtration system prior to purchase and compare its ratio to those of similar units. While in the end you will still wind up ‘wasting’ water in the name of getting thoroughly scrubbed drinking water, at least you did your due diligence in an effort to minimize the impact your wanting clean drinking water will have on the environment. 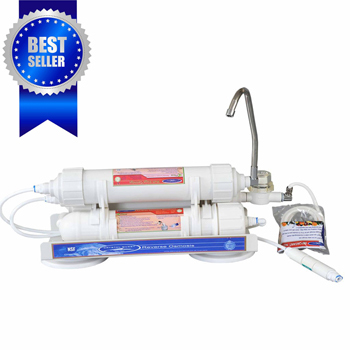 « Are All the ‘Good’ Minerals Removed by Reverse Osmosis Water Filters?